Now here is a cool mod for you! “As soon as you take a screenshot of your iPhone screen using the home/power quick tap method, QuickShottr uploads it directly to ImageShack and copies the link to the image into your clipboard, so you can paste it in any application you want.” Yep, that’s right…take a screenshot, it uploads it to ImageShack, it instantly puts the link in your clipboard and you can paste it anywhere! We posted a sneak peak of this commercial a few days ago…below is a better quality version. One of the longest awaited features of the iPhone is copy and paste. It works really well but does not work in all apps as claimed by Apple in the most recent announcement at the WWDC 2009 Keynote. Just hold down your finger to get the magnifying glass and place the cursor where you want to copy. When you let go you’ll get the option to Select, Select All, and Paste. It’s really easy to highlight what you want to copy, just drag the beginning and end points around until the text you want is selected. And, if you want more text selected, like from a web page, just drag up or down until the highlighted area turns into a box. Then drag the whole box around what you want highlighted. I wrote, a few days ago, that we would soon be seeing a new copy and paste application. It was actually released the next day! Well, I have finally had a chance to check it and so far, I like it. When you install hClipboard, you will first need to enable it in your Settings. To do so, go into your stock Settings application, General, Keyboard, International Keyboards and then turn on hClipboard. 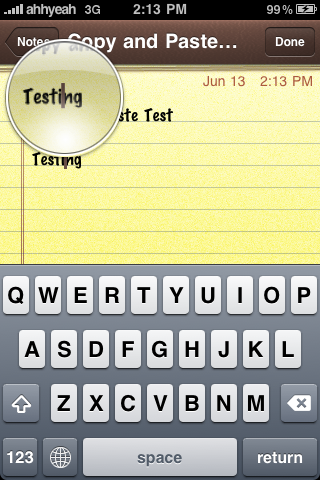 Now, in order to use the application you will need to be in an app that uses the keyboard…for example Notes. 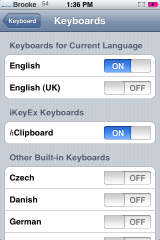 To enable hClipboard, select the Globe icon on your Keyboard. 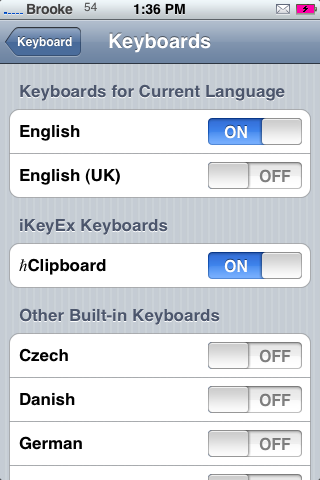 You will now see the hClipboard keyboard. We recently wrote a post about a nice copy and paste application called Clippy…check it out here. Well, it seems that there is another copy and paste app called Clipboard in the making! It is not quite ready for Cydia (though, we should see it in the next few days). Clipboard also seems to use the keyboard as the method for launching the application though, the interface is different than Clippy. For more info, you can check out the app’s wiki page. But, until it is available in Cydia and I can test it, I can’t tell you how it will compare to Clippy. Thanks to Manfred for the tip! We are finally getting closer to how copy and paste should work!! Clippy Beta is a very cool copy and paste application available through the iSpazio source. 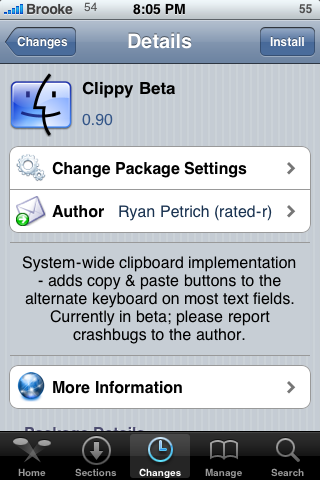 When you install Clippy Beta, it will automatically add the copy and paste features to your iPhone or iPod Touch’s keyboard. 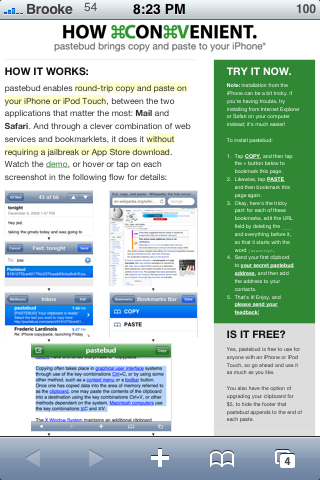 I’m sure many of you have heard about pastebud releasing copy and paste today for the iPhone and iPod Touch. Well, I finally had a chance to test it for myself. Below are instructions on how to set-up and use pastebud’s copy and paste technique. The pastebud method of copy and paste allows you to copy and paste between Safari and Mail. This is basically achieved using a series of bookmarks via Safari. The initial set-up can be a little tricky (I will walk to through it) but, after that, it is a very sleek and smooth process! TextGuru is a pretty sweet text editor. It included features like cut, copy and paste within the app. It can also read Microsoft Word, Excel and PowerPoint files along with PDFs. Don’t be mistaken like others, this app only READS the previously named file types, but does not edit them.